School is out for summer! With both children home all the time I know we are going to have so much more cleaning to do. It seems to triple over the holidays in our house. With that in mind we are bringing you a new giveaway today with Milton. Milton first began in 1967 with the Milton products being used in the trenches of the First World War to treat skin burns. After the war ended Milton became a household brand for it's use as an antiseptic and disinfectant. In the 1940's there was an outbreak of gastroenteritis, which caused the deaths of 4,500 babies aged below one. After this Milton developed their cold water sterilisation method Which saved thousands of babies. Today Milton have a full range of products that are perfect for both at home and on the go. One of the products from the Milton range is the Antibacterial Hand Gel. With summer bringing a whole lot more days out as a family I know that hand gel quickly becomes an essential that I keep in my bag. This Milton Antibacterial Hand Gel comes in two sizes, a larger bottle which is perfect for keeping near where you change baby and a smaller bottle that is perfectly sized for on the go use. With the ability to kill 99.9% of germs in just seconds! There isn't much more you will need from an antibacterial hand gel. One thing I do find with antibacterial gels is that they dry my hands out really badly, not a problem with the Milton Antibacterial Hand Gel! Milton's gel has added moisturising agent to help soften and protect your skin. Both of the Milton products are just perfect for summer. With little ones around there is always going to be something that needs cleaned up. With the messes at home the Milton Antibacterial Surface Spray will be perfect for combating and disinfecting any surface I need to. While the Milton Antibacterial Hand Gel will be a life saver when we are out on day trips and can't find baby changing or D has grabbed something he shouldn't! Perfectly sized to pop in the changing making it great for us to use while out and about. 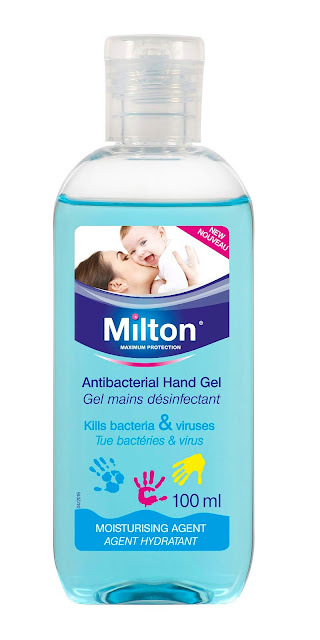 You can purchase Milton Antibacterial Hand Gel 500ml (RRP £5.99) and Milton Antibacterial Hand Gel 100ml (RRP £1.39) at most major supermarkets, Boots (click the links to shop), Ocado, Superdrug, Babies R Us, Kiddicare and Precious Little One. Milton have been very kind and offered one of our readers the chance to win a travel sized Antibacterial Hand Gel (100ml). For your chance to win you can enter using the Gleam widget below. Do take a read through our terms and conditions before entering. The hamd hel sounds perfect for popping in my handbag or pocket when out with the dog! I use their spray for cleaning surfaces around my home too. I like that it has the ability to kill 99.9% of germs in just seconds. I love the idea of anti bacterial hand gel for use at home and at work. Perfect! I love how we can clean our hands on the go, great for when you're out and about! I like that it’s available in a larger size than the tiny bottles that are usually available! Milton is a very trustworthy brand too.